Please feel free to edit this page as we do with the daily page. The purpose is to add pictures and discussion about the various options ofor track and ballast, our experiences, ideas and experiments, so we can learn from each other. OK, here's a starter for 10! (NHN, 6/10/10 in his coffee break!). I use LGB track, but only because we already had some, from years ago, and it seemed sensible to continue with it (before the huge price hike!). Yes, it is crude and chunky, but it is also bullet (or dare I say, elephant!) proof, my railway gets a fair bit of rough and tumble. I ballasted with BnQ chippings, I think its horticultural grit or something like that, which markedly improved the appearance. However, that also retained water, which in 4 1/2 years has seen off the allegedly waterproof plywood base, despite it being well painted beforehand. Lesson learned - next time, real wood, maybe covered in roofing felt and then ballasted? This is what a friend across is doing, which I think may be the answer - no ballast on the roofing felt makes the track look just too crude. I really admire the appearance of finer track, be it Peco or something like Neil R has been posting elsewhere on the board, but I worry about the long term reliability of it? I get a lot of heave in my lawn (water table about 6 inches below it!) so the track base gets puller hither and thither regularly by nature. If it ever froze the posts would pop out! An old photo attached, hopefully showing the rather new looking track - the rail weathers down nicely in a year! 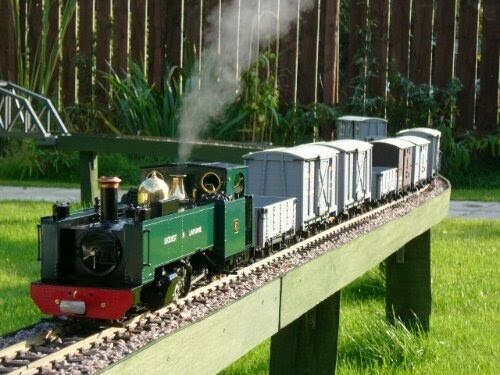 I had no choice but to make my own track for 15mm scale Irish broad gauge. I was inspired by the small rural lines, especially the Sligo Leitrim and Northern Counties Railway. This line used mainly 60 to 70lb flat bottom rail, for which David Halfpenny recommended Code 250 rail. I tried a trial bit, but thought it was still looked a bit too chunky compared to the photos, so I used Code 215 instead. As the sleepers are 130mm long and closer together than my NG line, I didn't want to spend a lot on stripwood, so in the end I used scrap timber from the farm next door. My plan was to cut this down to 10x10mm on a table saw, but I got scared for my fingers and cut the 25mm thick planks into 10mm strips instead. I introduced a little variation in length and thickness now and again as I could see in the 1950's photos of the real line. The track looks a bit odd with such deep sleepers, but once ballasted with 3mm chippings, it looks good and is held quite securely. The rail is held with galvanised scale dog spikes, which have rusted slightly and look great. I bought these from a very helpful chap building track at the the Telford NG show (Robin Saxton - 301 Models). I built a little brass jig to predrill the spike holes, and then hammered them in with the rail in situ. Unlike my NG track, which is screwed down with battens to concrete blocks, this track is held in place by the ballast. I don't expect to run on this line as often as the NG one, so it isn't exactly practical - I am trying to demonstrate the different feel of the standard gauge, as I hope you can see from this photo. The ballast doesn't look so overscale on the wider track. It locks together very well, and looks grey rather than green when in use. I sieve out the largest bits. Track is all Aristocraft, a mix of European and American sleeper arrangements, not that you get to see the sleepers that often, as it is Ballasted I.O.M. style over the sleeper tops. For Ballast I have taken to using Billown Quarry Dust, the finest grade produced by a quarry I deliver the mail to. It goes on dry, is brushed into place and then given a light soaking with the hose on fine spray. Sets solid, but is fairly easily altered if needs be, then just soak it again, and best of all, I get it free. ...where as the sunnier parts of the railway remains as a plain gravel look. These sunnier areas need the ballast topped up more, being more exposed to the rain on the liquid sunshine days. The picture below was taken just after a track maintenance day, you can see the areas which have had a ballast top up.